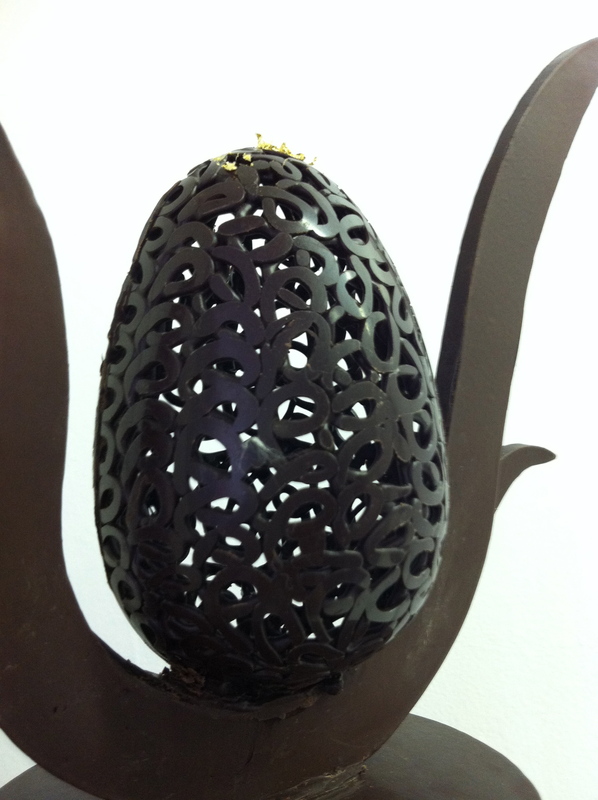 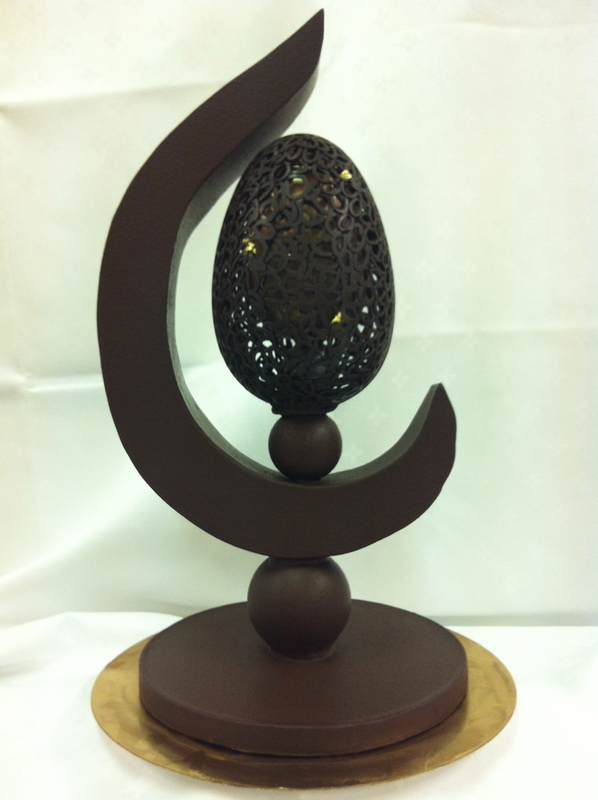 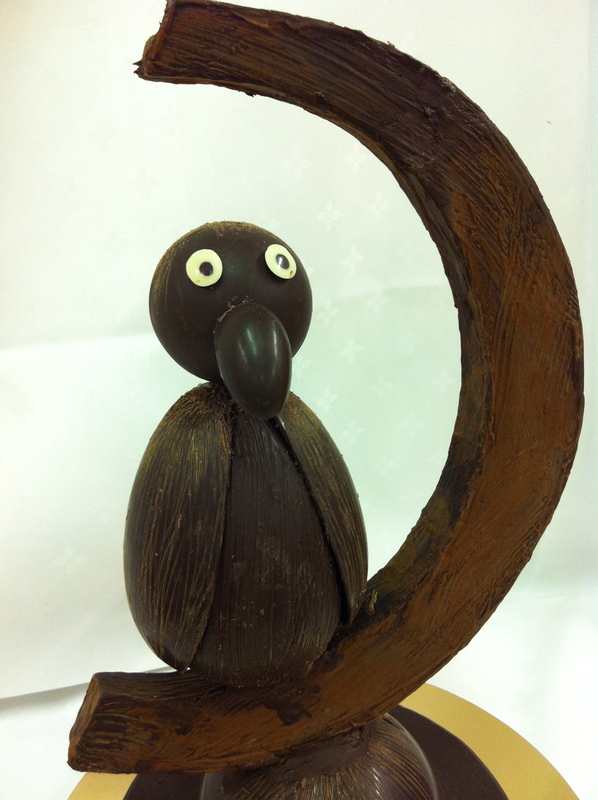 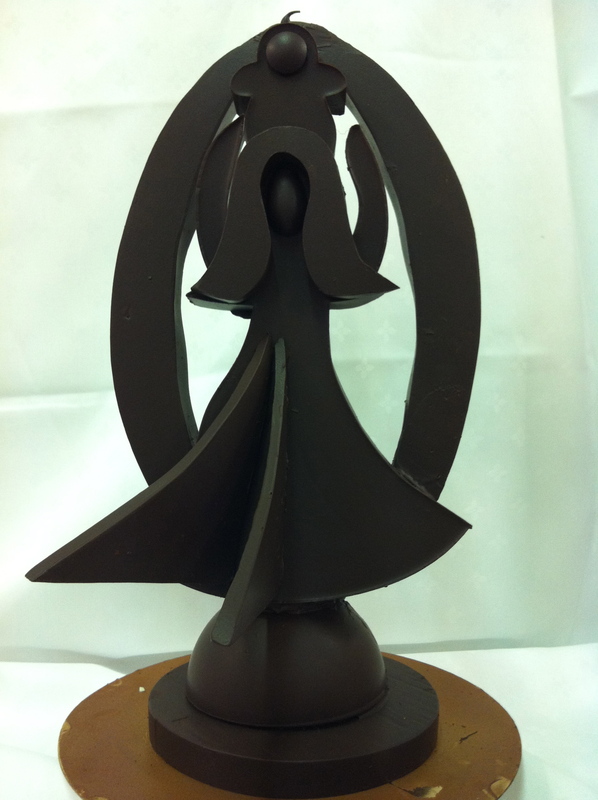 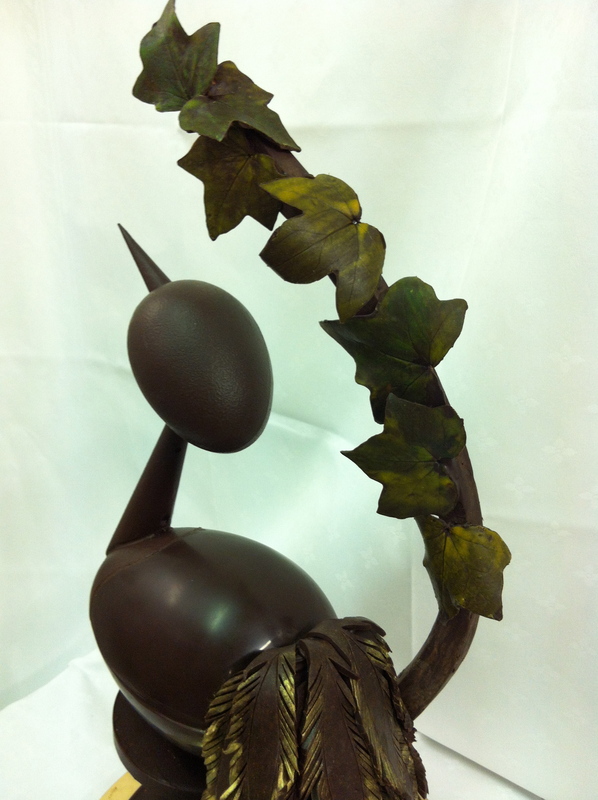 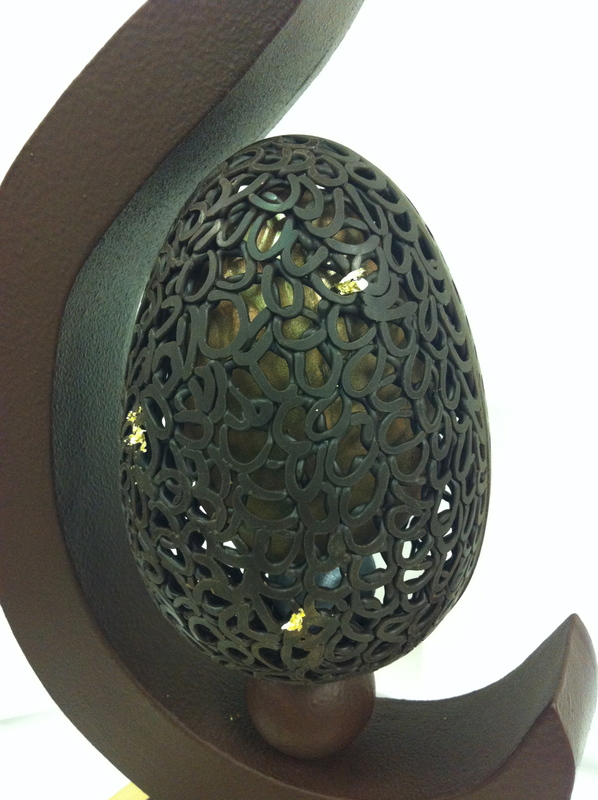 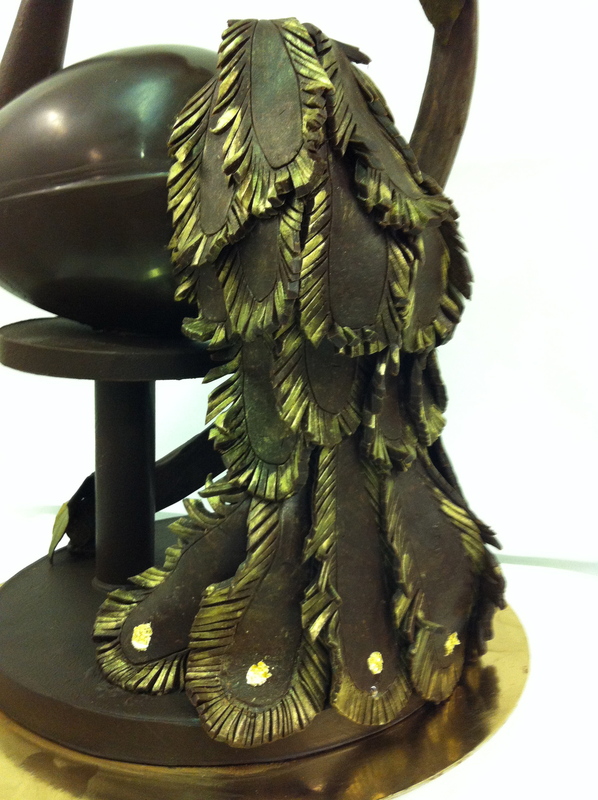 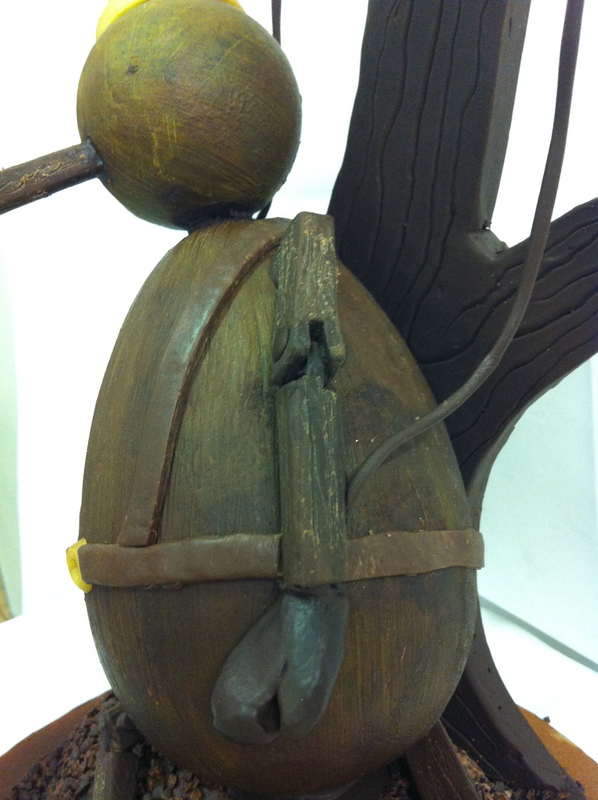 The goal of this project is to use a chocolate egg in a sculpture but it not be an egg, it must have only the egg form. 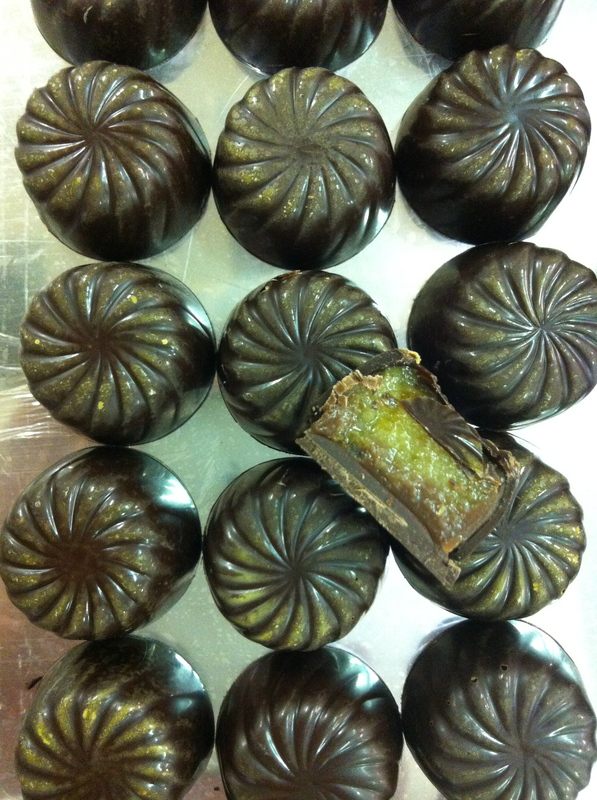 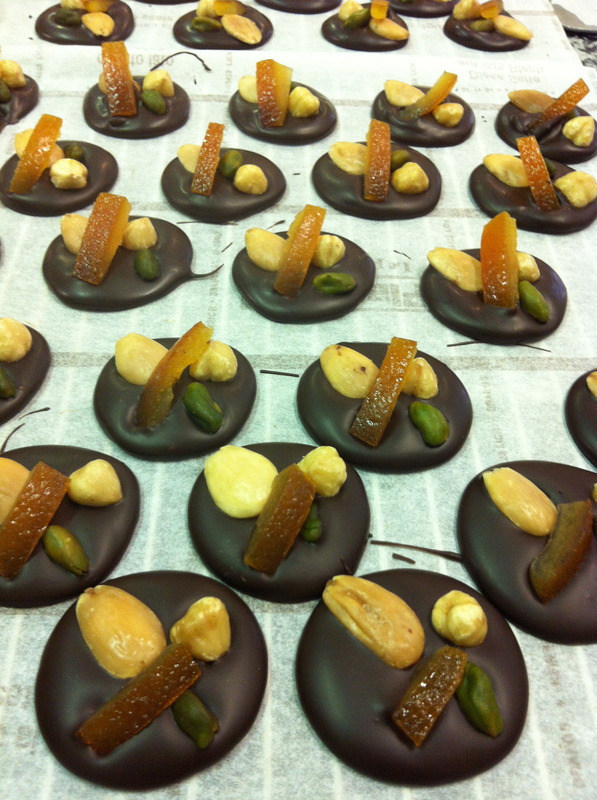 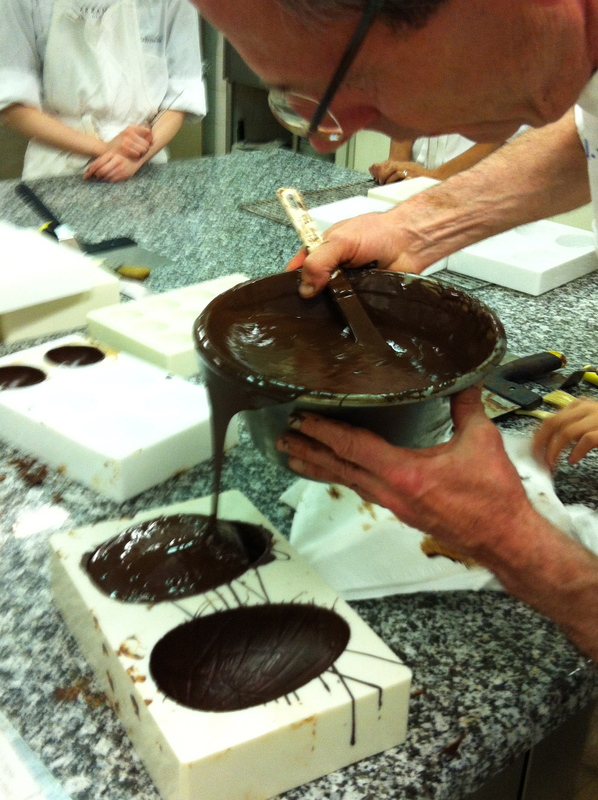 Showing off our chocolate tempering skills is also part of it. 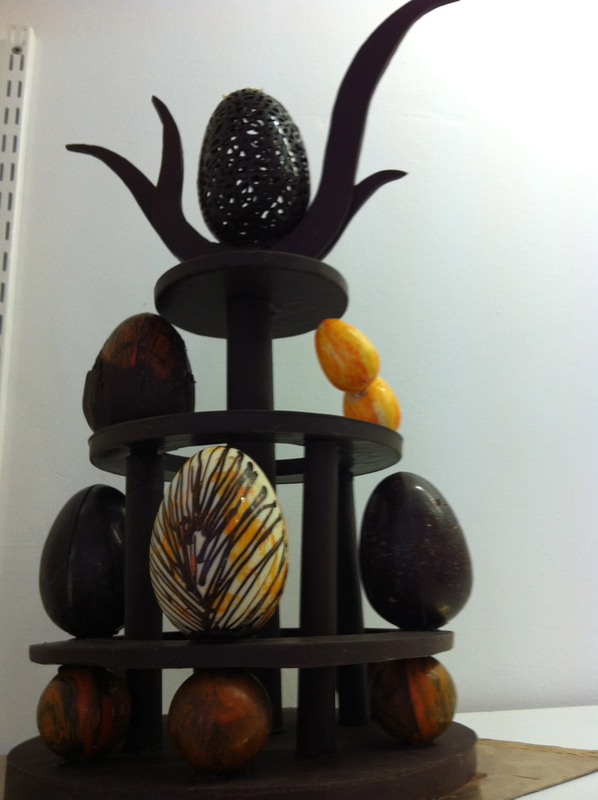 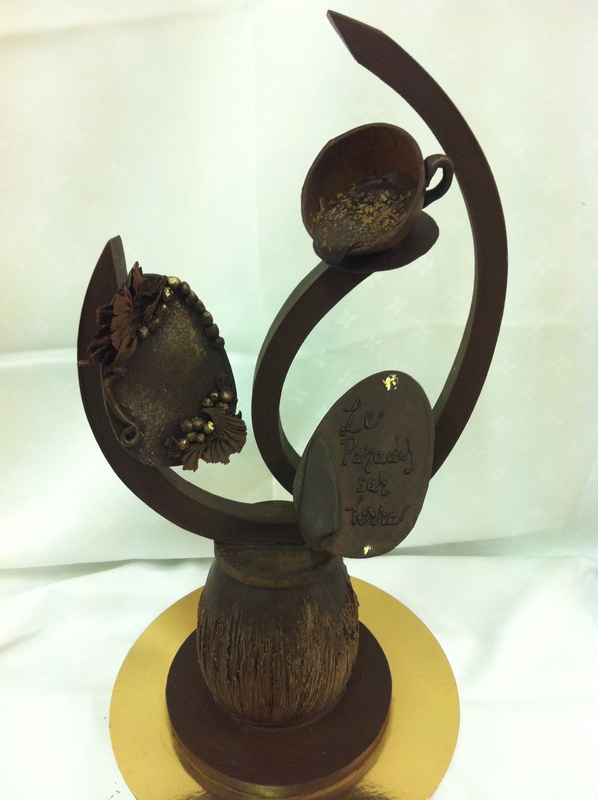 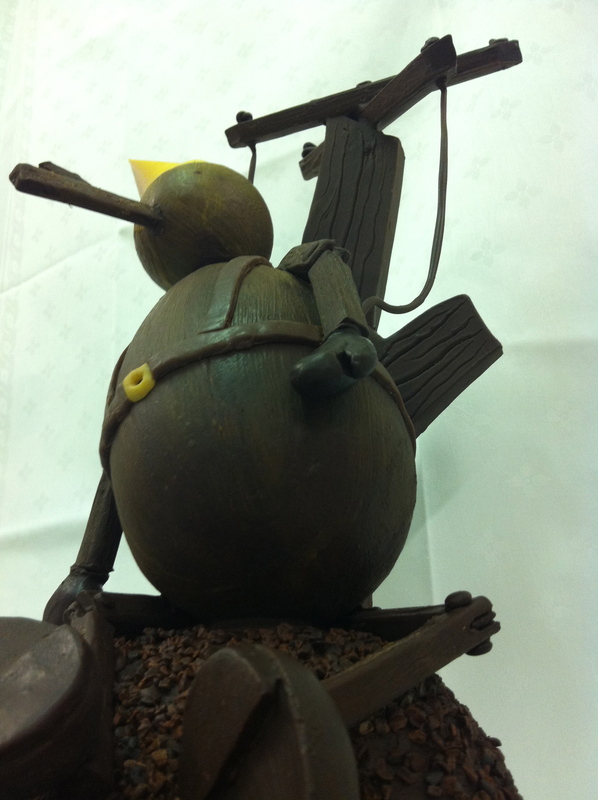 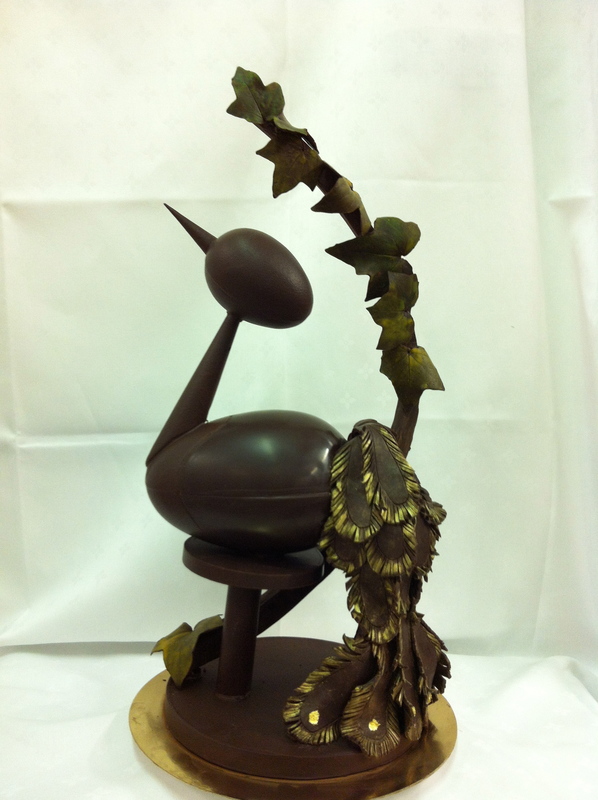 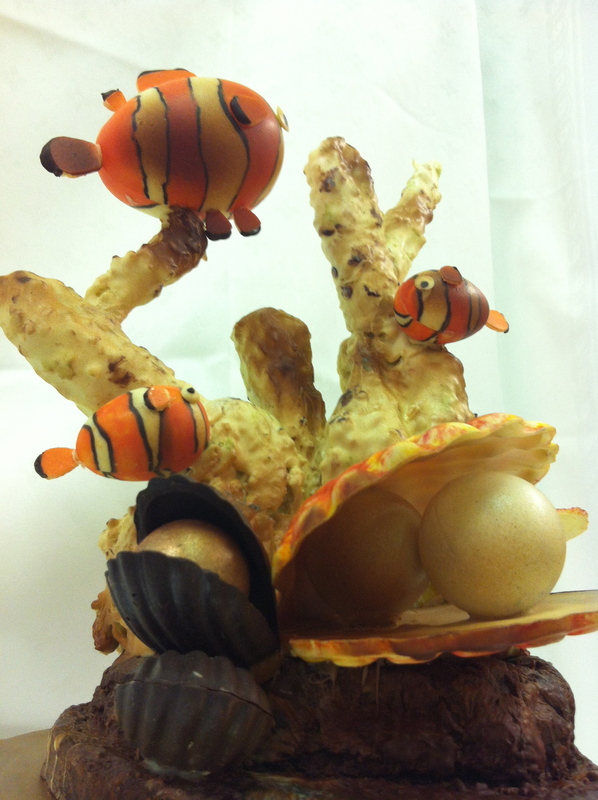 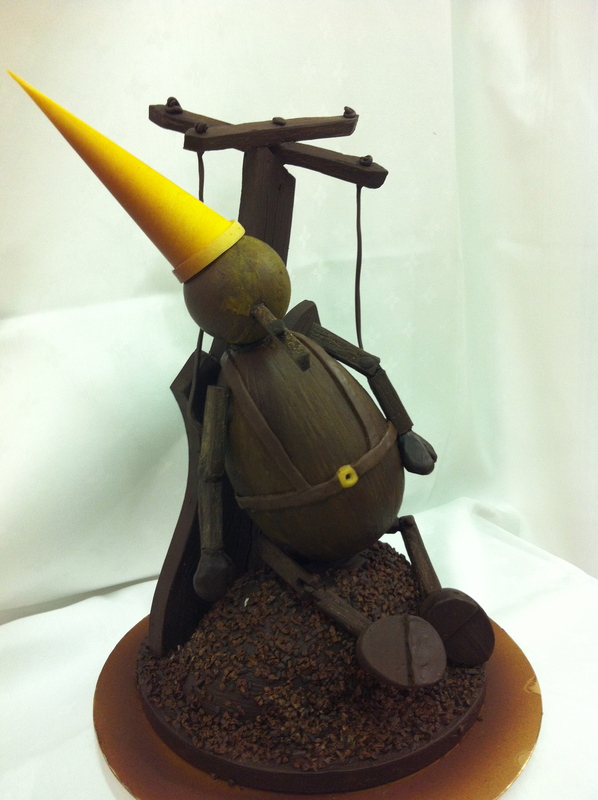 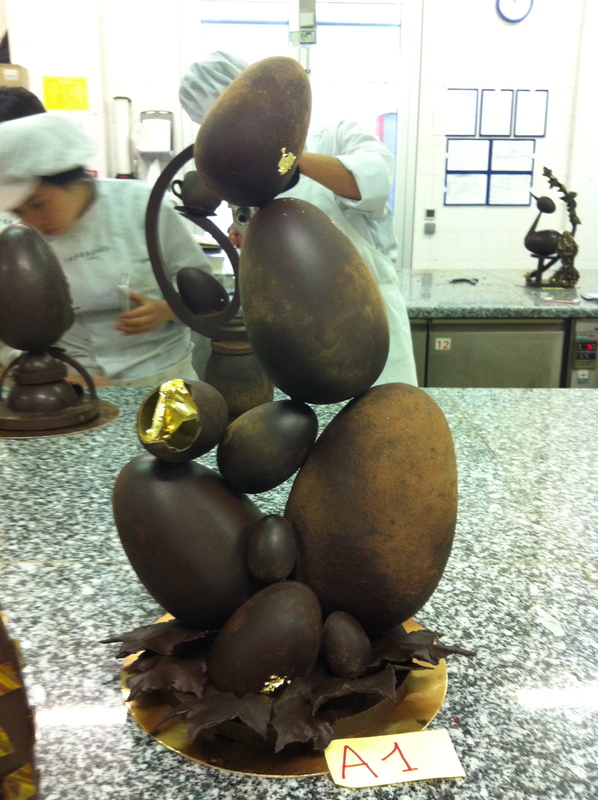 Here are the chocolate egg sculptures created by Ferrandi Pastry students of class Anglo A, 2013. 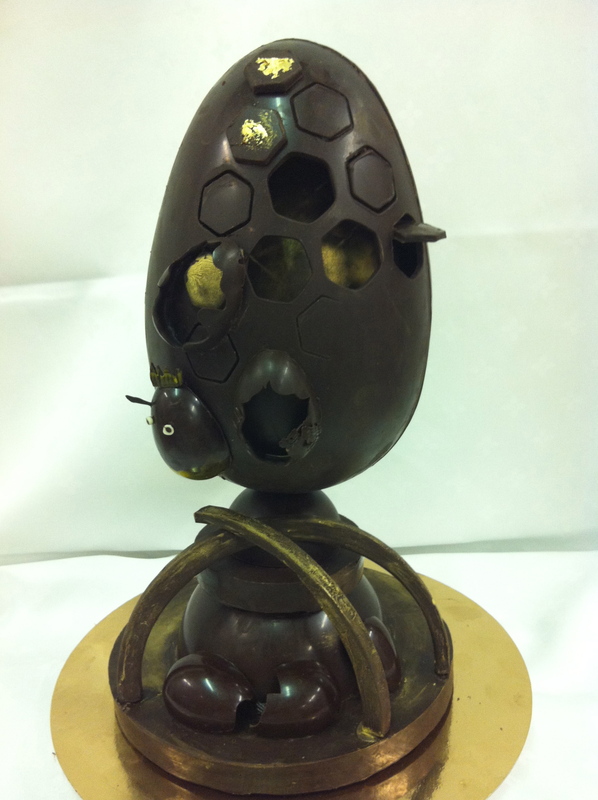 The Golden Bee Hive by Emily. 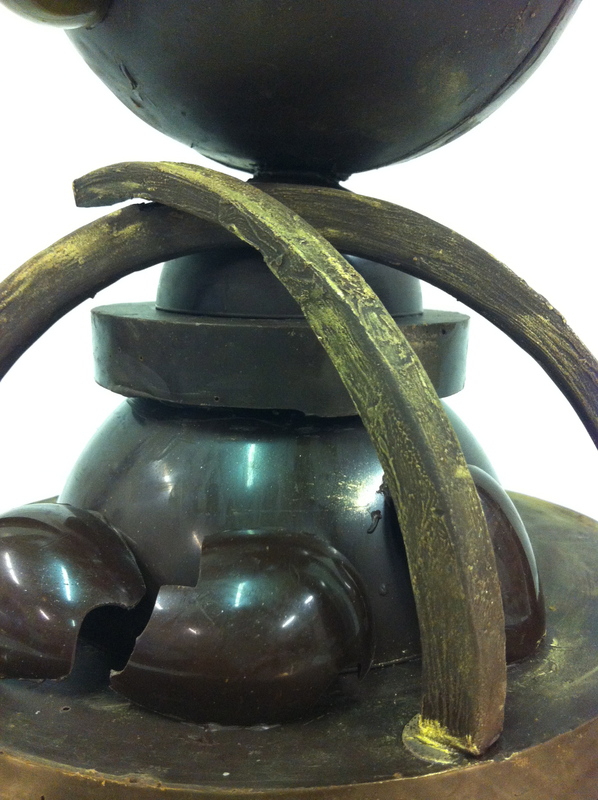 Tea cup & Poems by Christine. 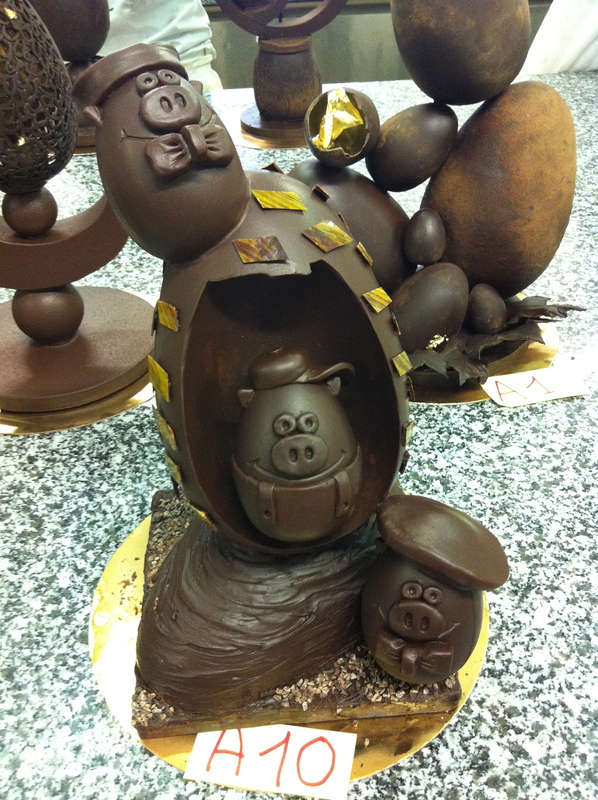 The Three Little Pigs by miss pirisi. 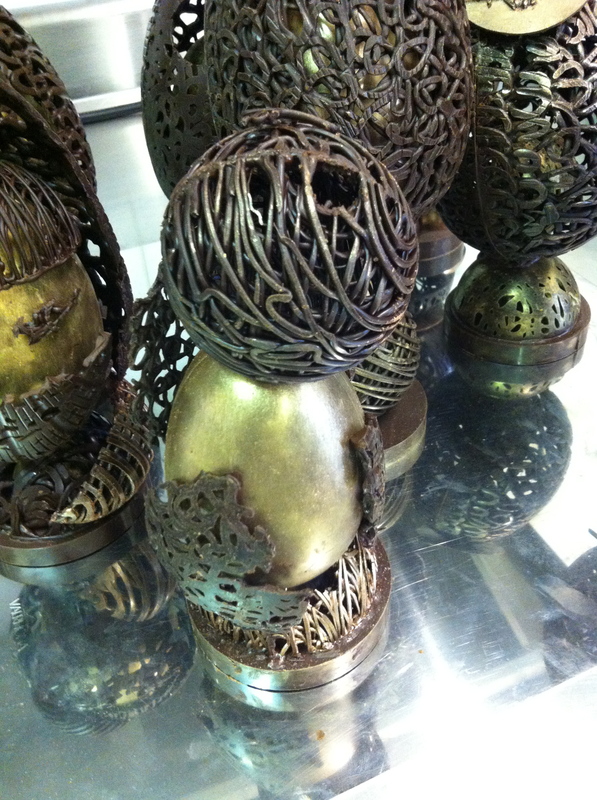 The Emperor’s Egg by Jacek. 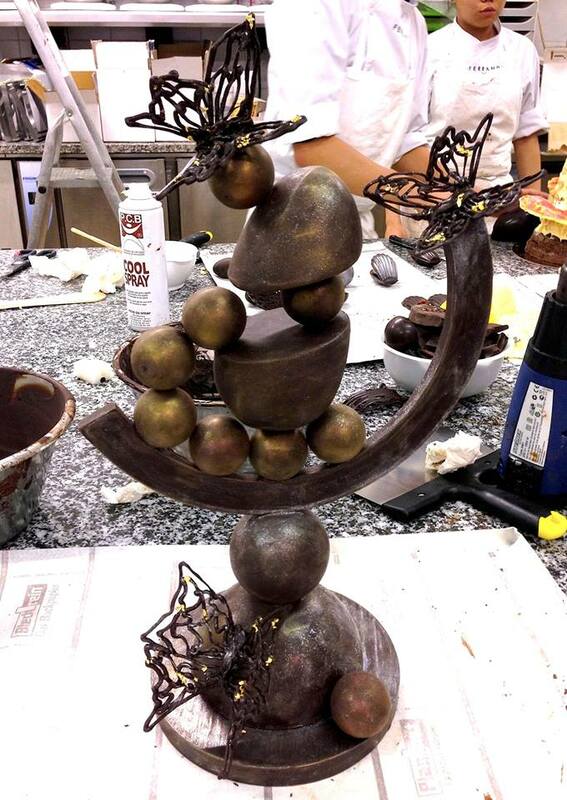 Pearls, Moon & Butterflies by Nicole. 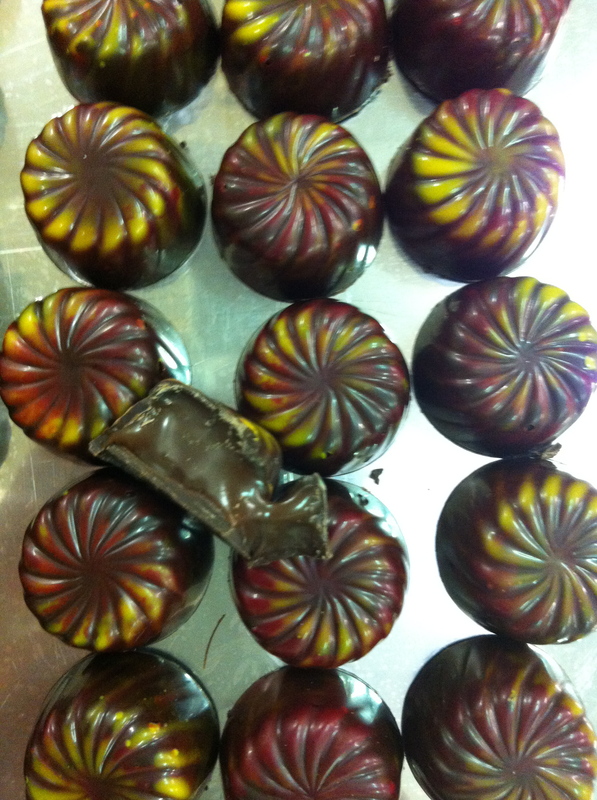 After The Rain by Nicole. 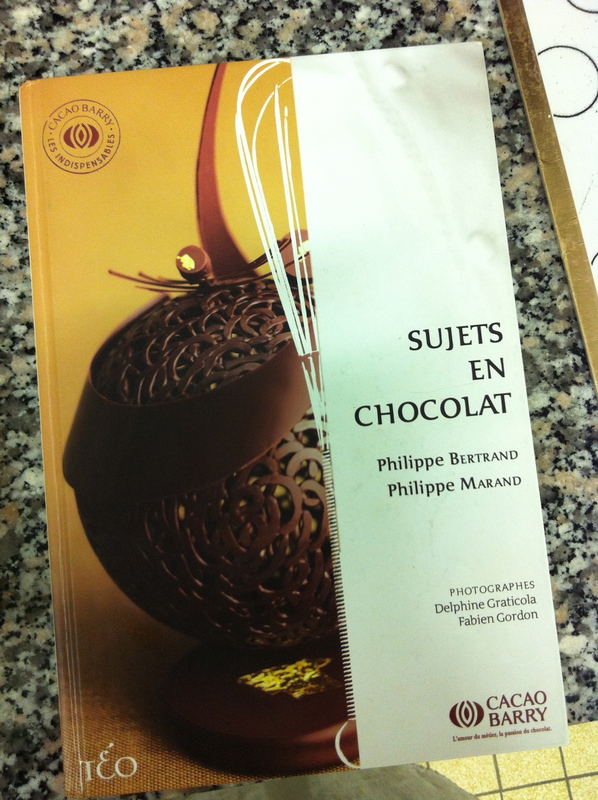 This book is a good one if you’re needing a guide to molding chocolate. 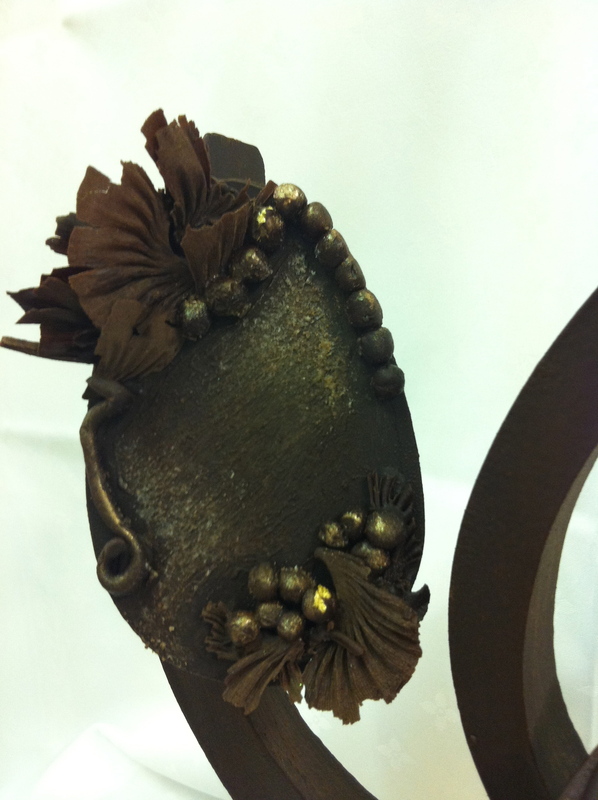 The techniques are there as well as creative ideas. 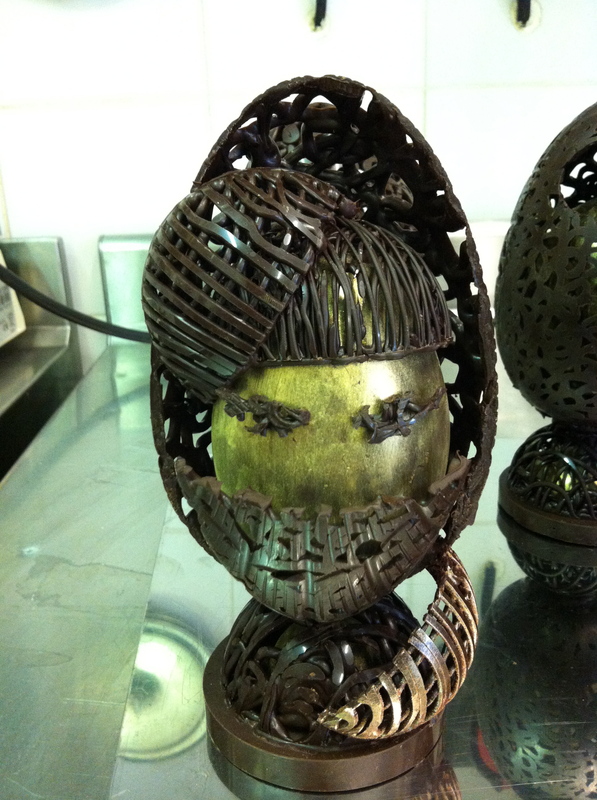 This post is still being updated. 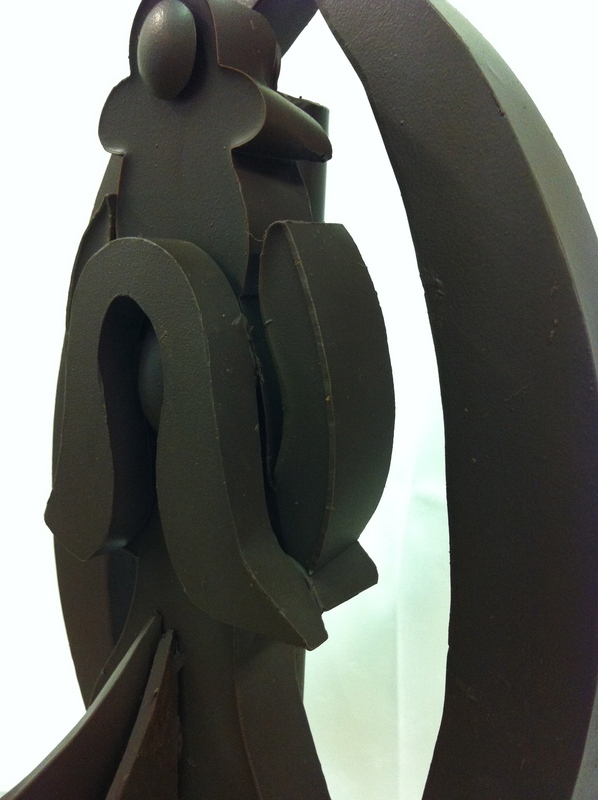 Details to come. 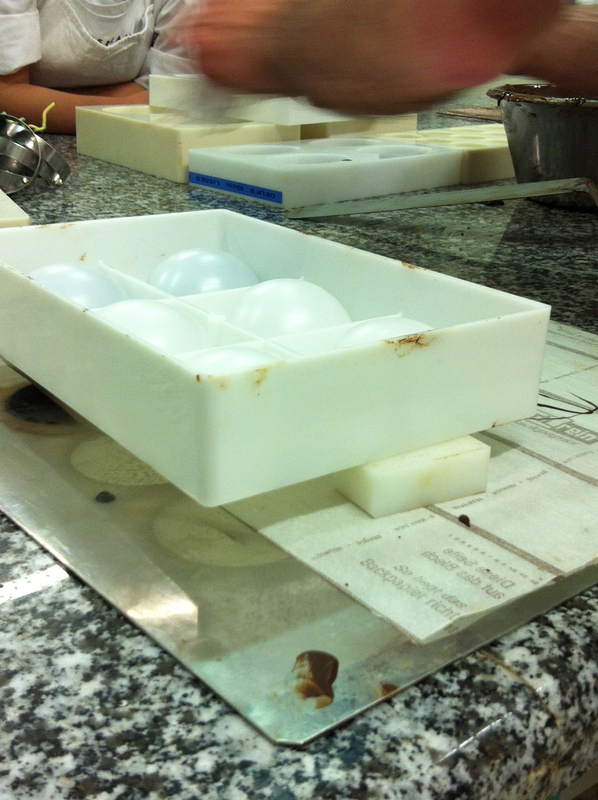 The set gelatin egg mold is positioned into a larger egg mold. 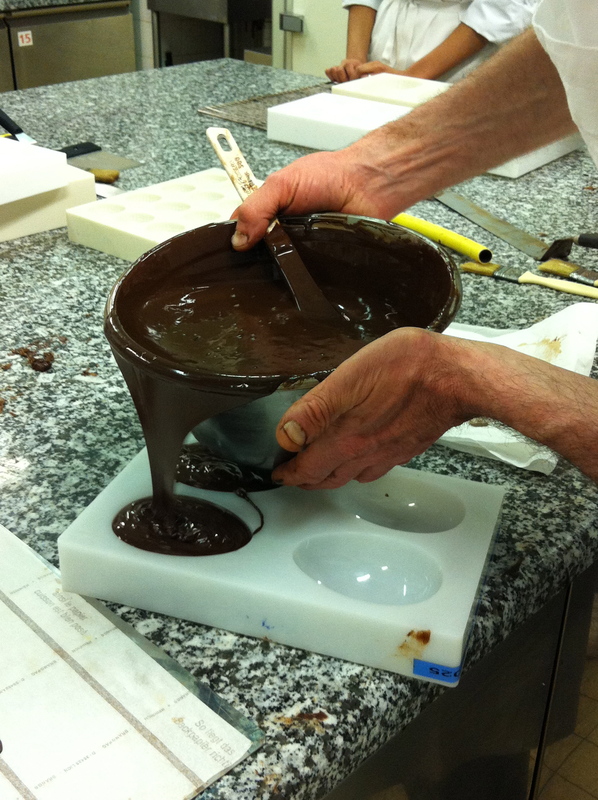 Brush chocolate then pour. 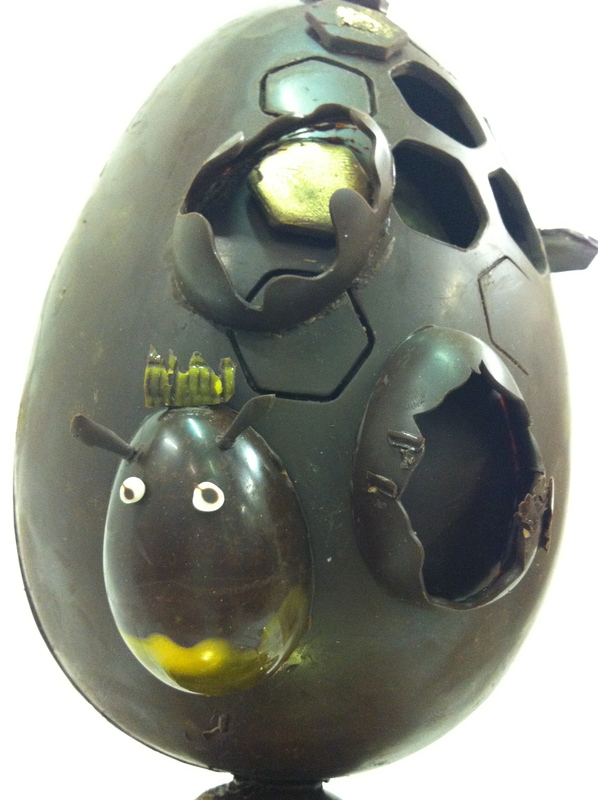 This is how you’ll have an hole in your chocolate egg because the gelatin mold will be removed once the chocolate is set. 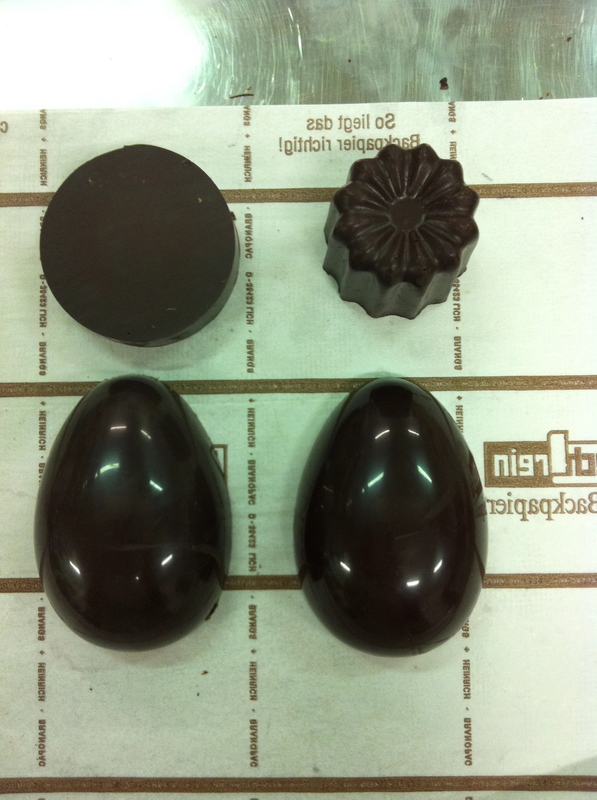 The left mold has the gelatin egg mold which is now covered with chocolate by brush. 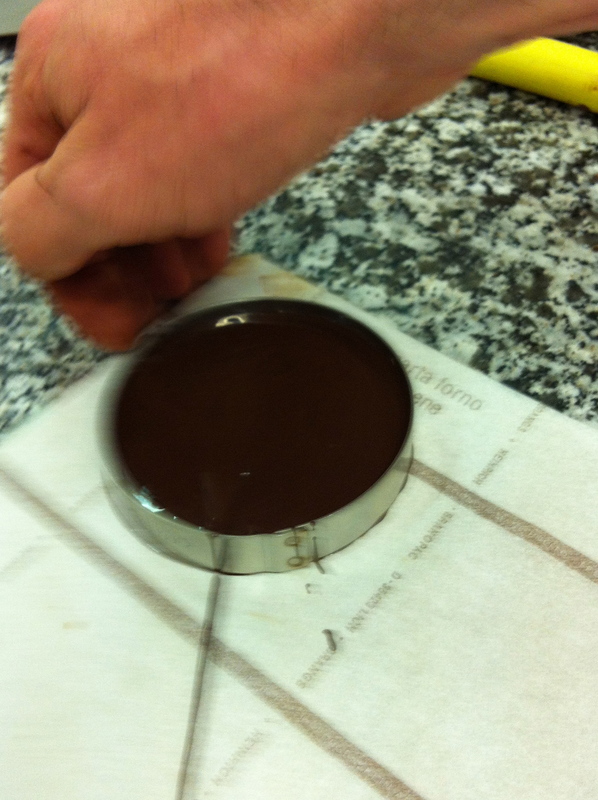 Now pour the chocolate to the rim of the molds. 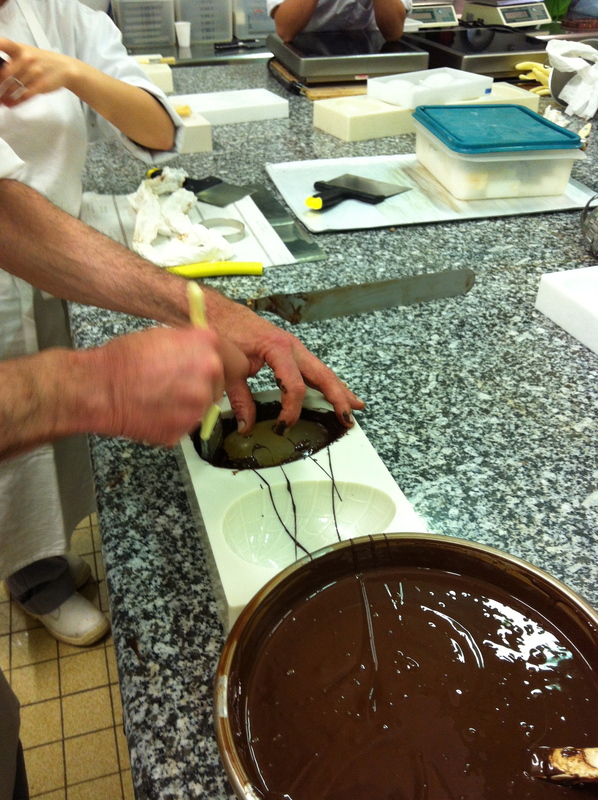 Now tap with this hose looking devise (yellow tube) it’s to bust the bubbles in the chocolate. 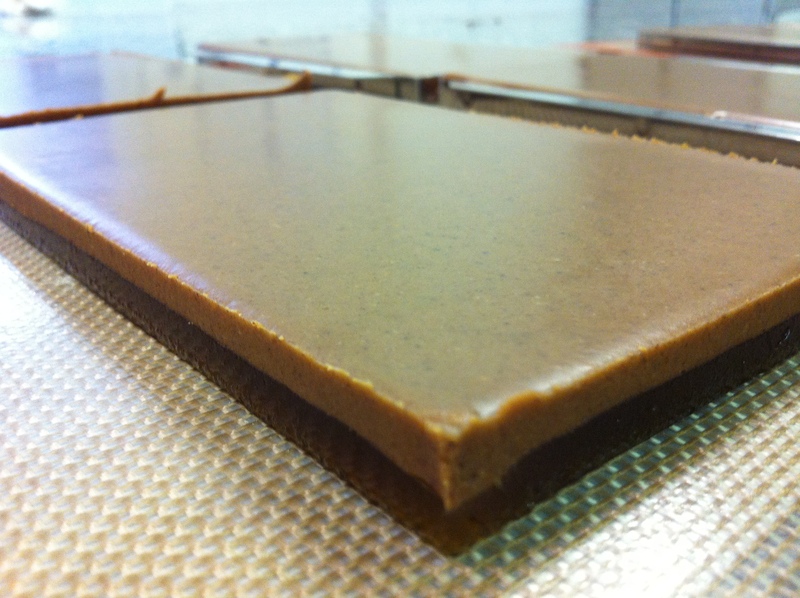 You do this before flipping the molding tray upside down. 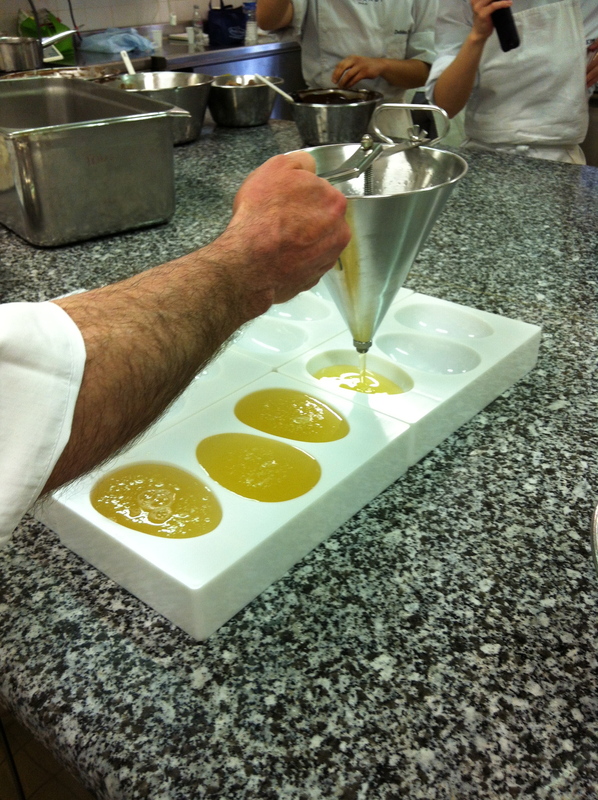 Quickly turn mold upside down and tap with the yellow tube/hose. 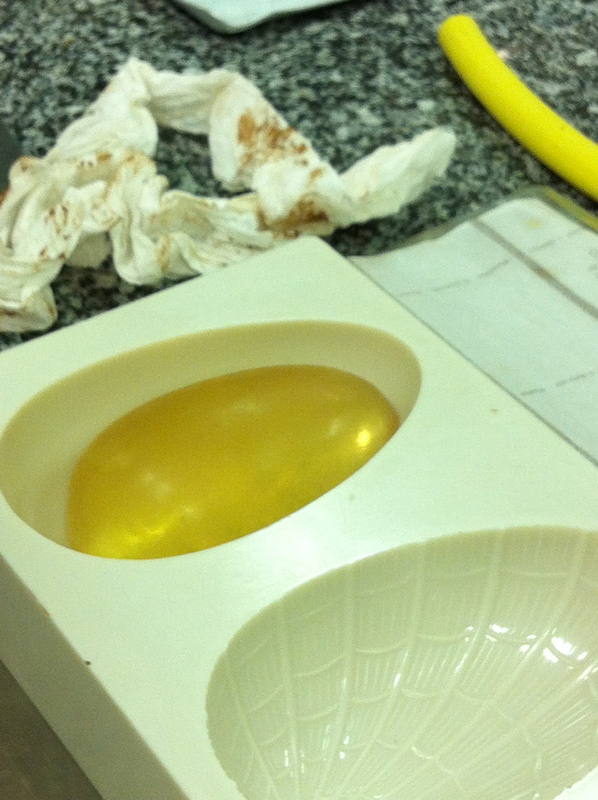 This process is so messy! 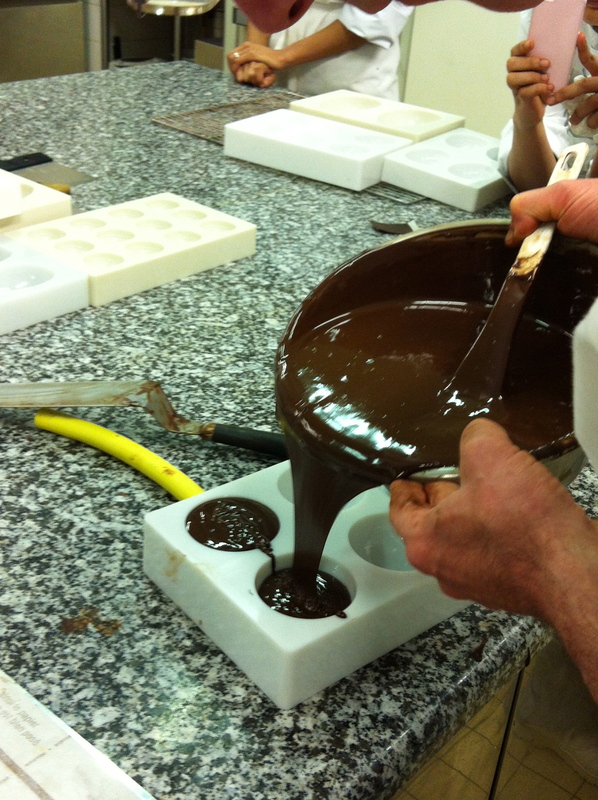 Place mold upside down to set onto little blocks before pouring your second & or third layer of chocolate. 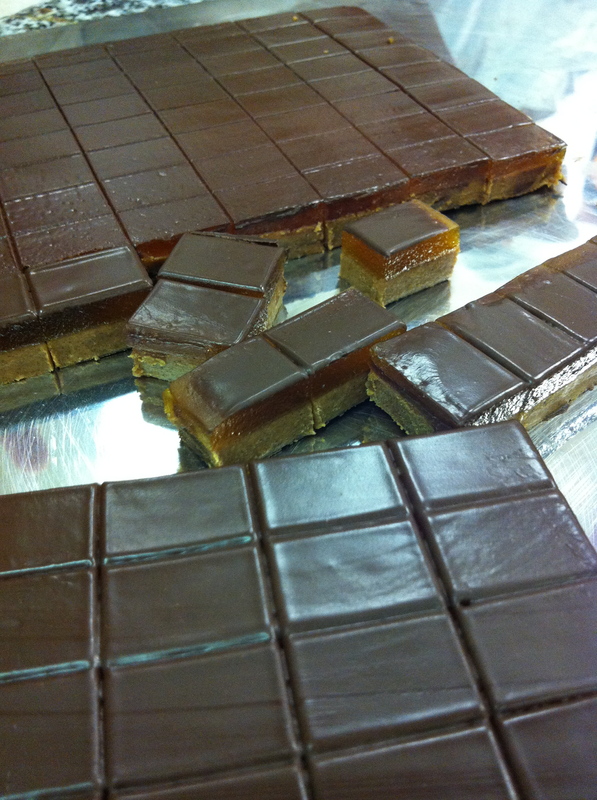 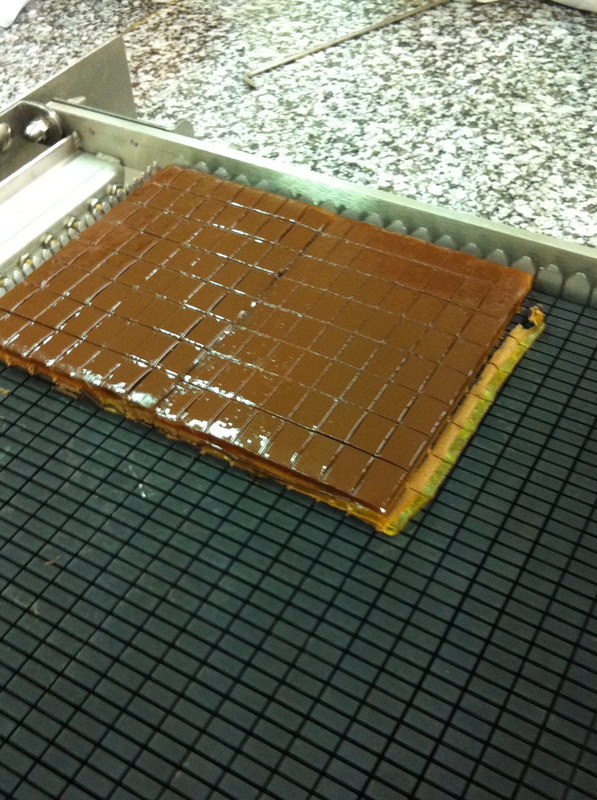 After your last layer of chocolate place the mold directly onto the tray (flat surface) and not on the blocks. 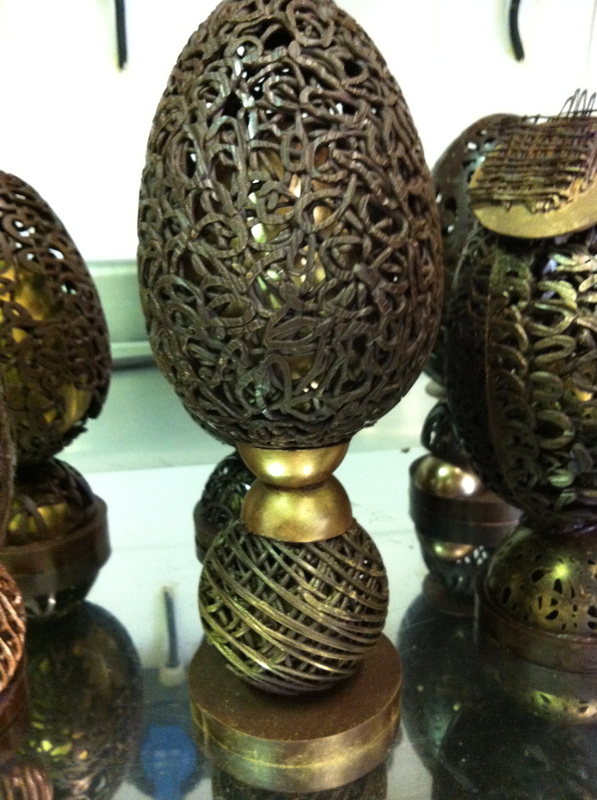 Egg mold with no gelatin mold. 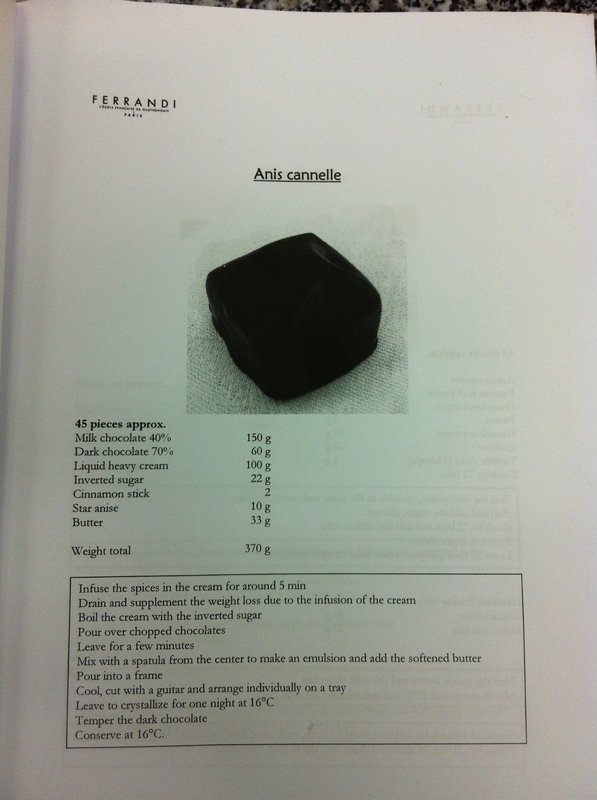 Very straight forward. 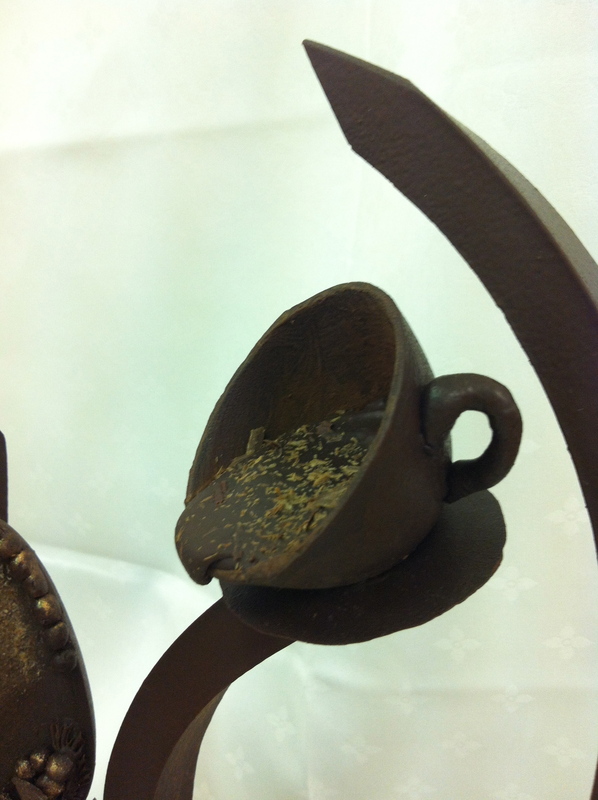 No need to brush chocolate just pour up to the rim. 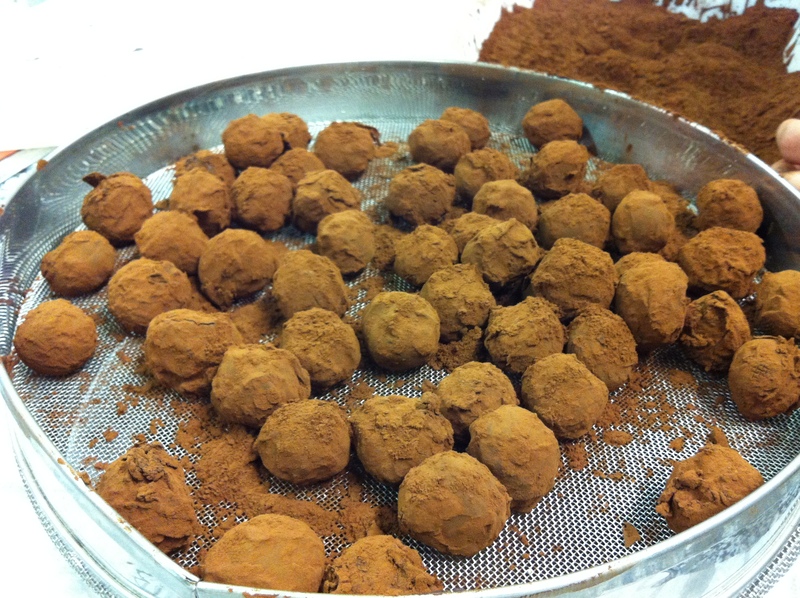 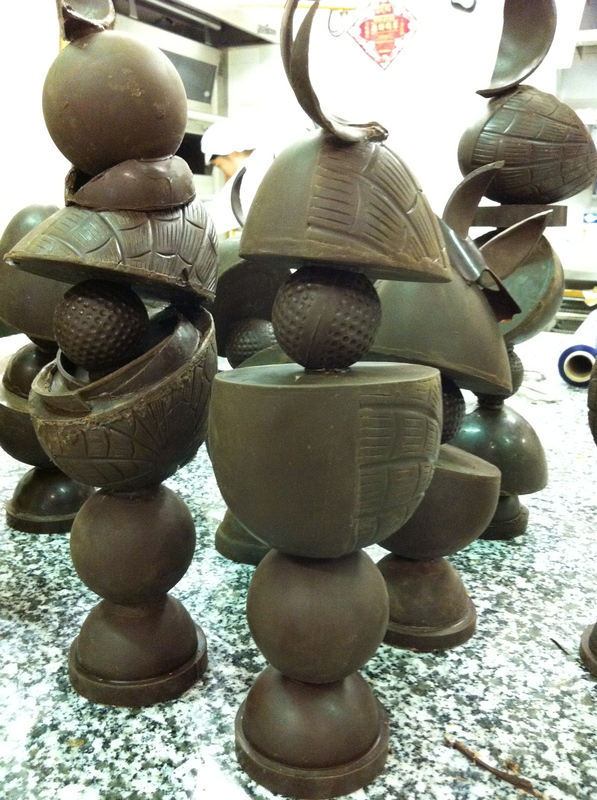 Making chocolate balls or spheres. 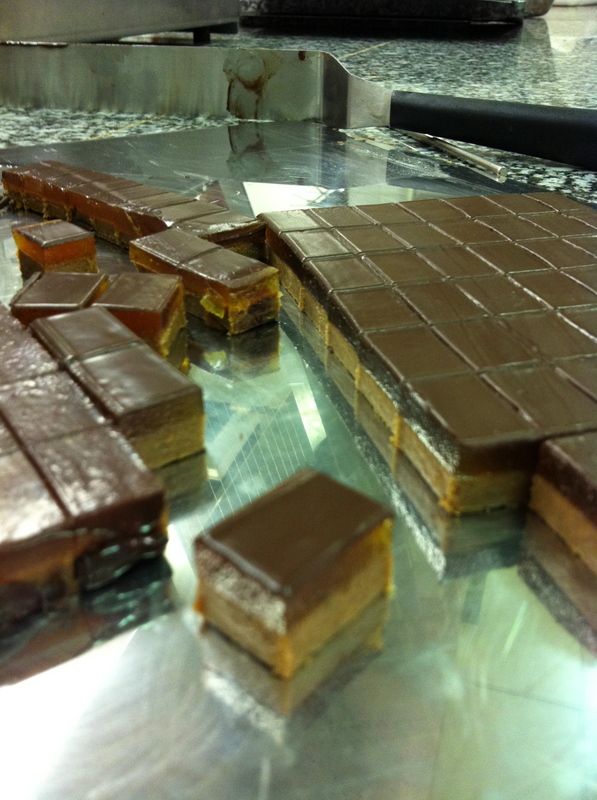 Again no gelatin just simply pour chocolate to riim. 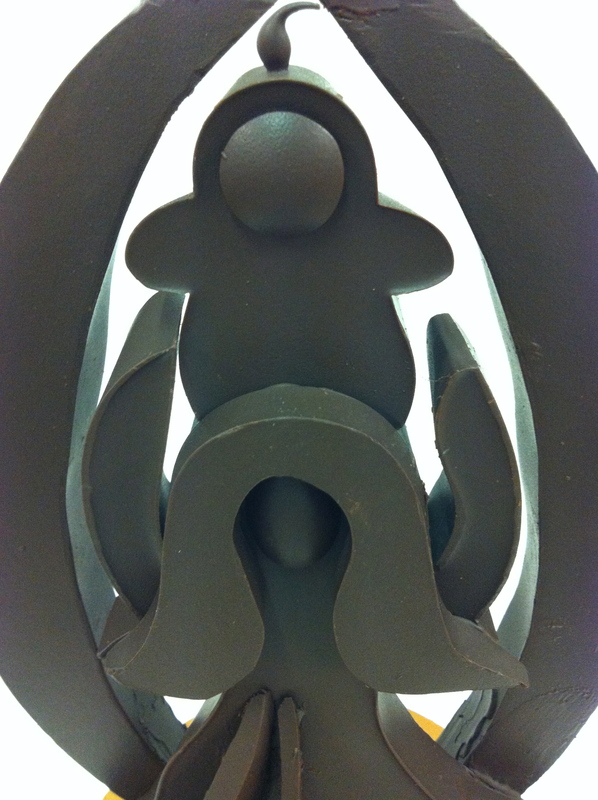 This is a circle ring. 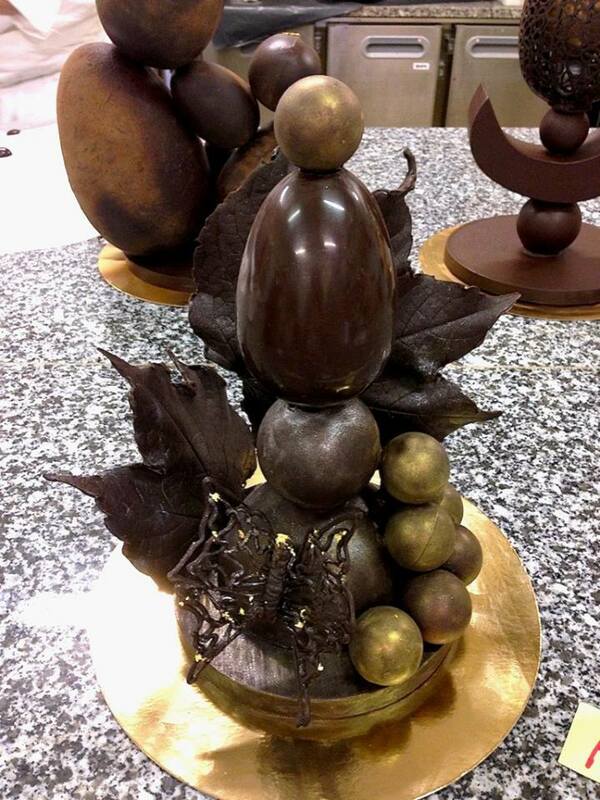 Fill it completely with chocolate and set it in fridge. 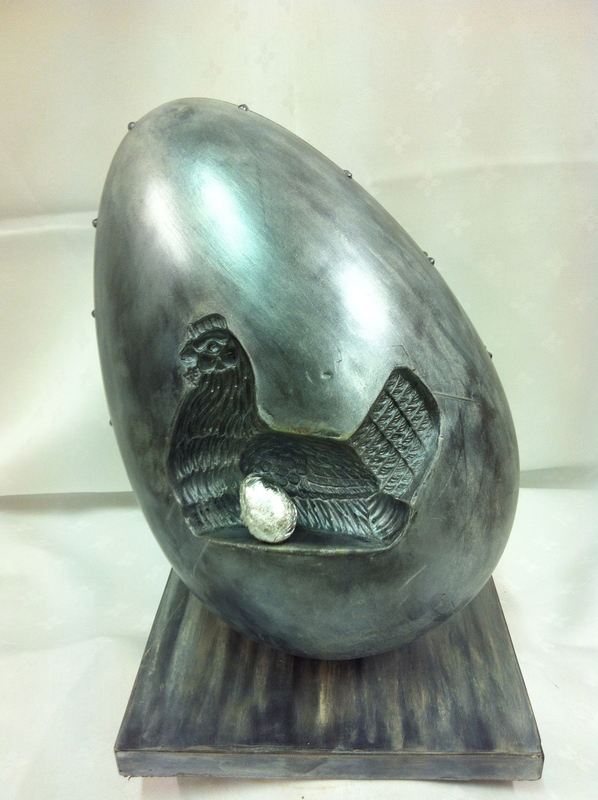 This will be your base for your egg structure for example. 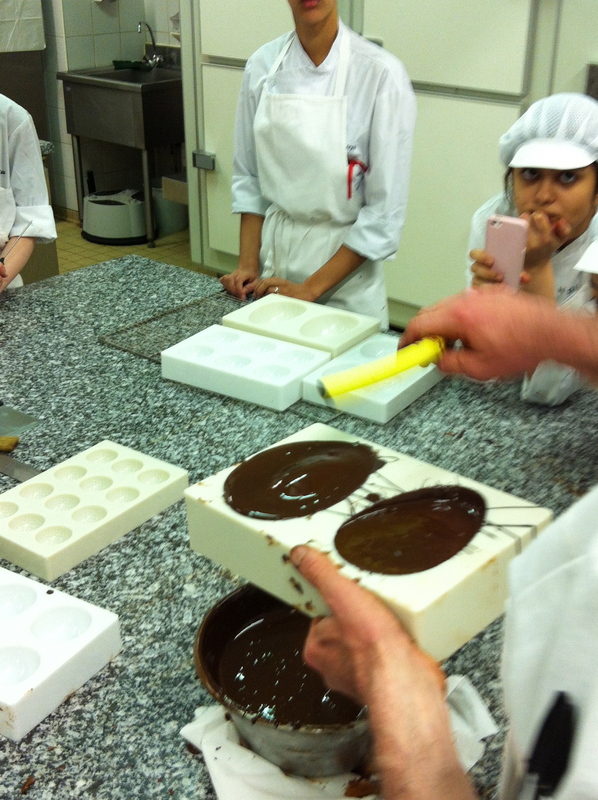 Learning to mould chocolate. 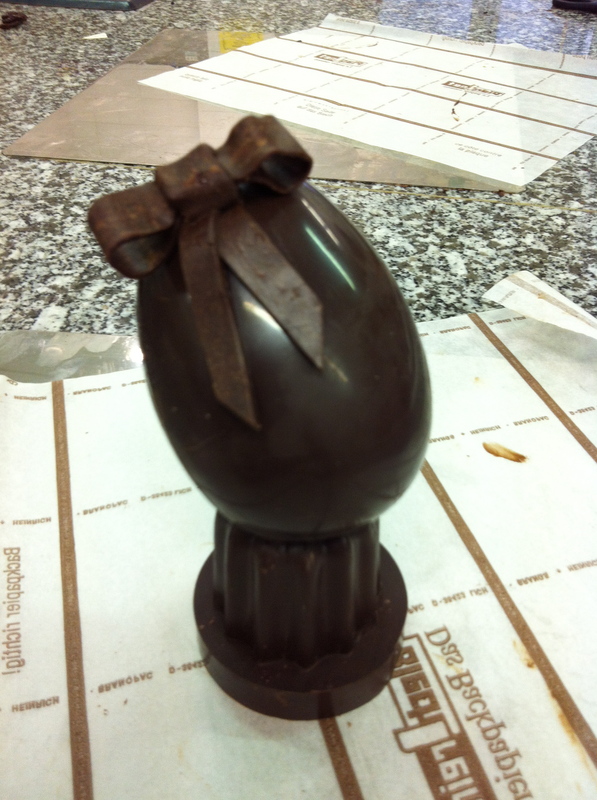 Start with an egg. 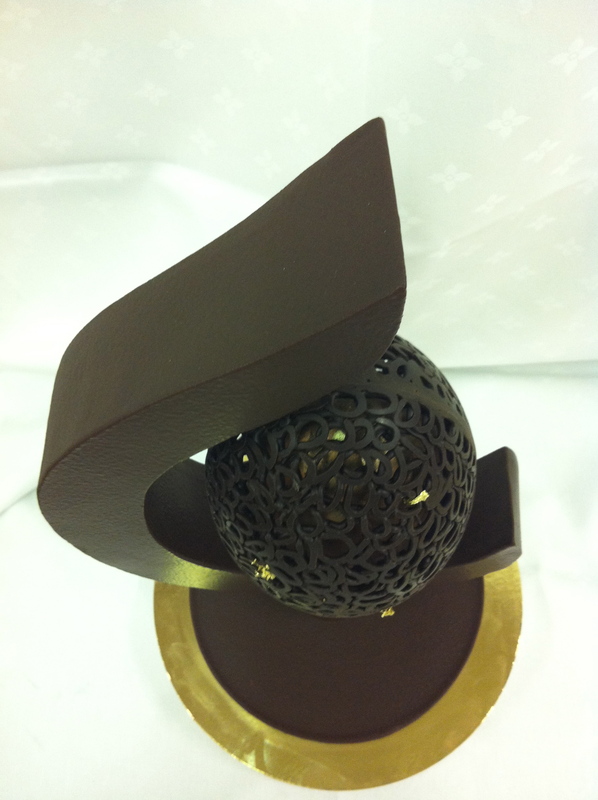 After almost a month of entremets we move to working with chocolate. 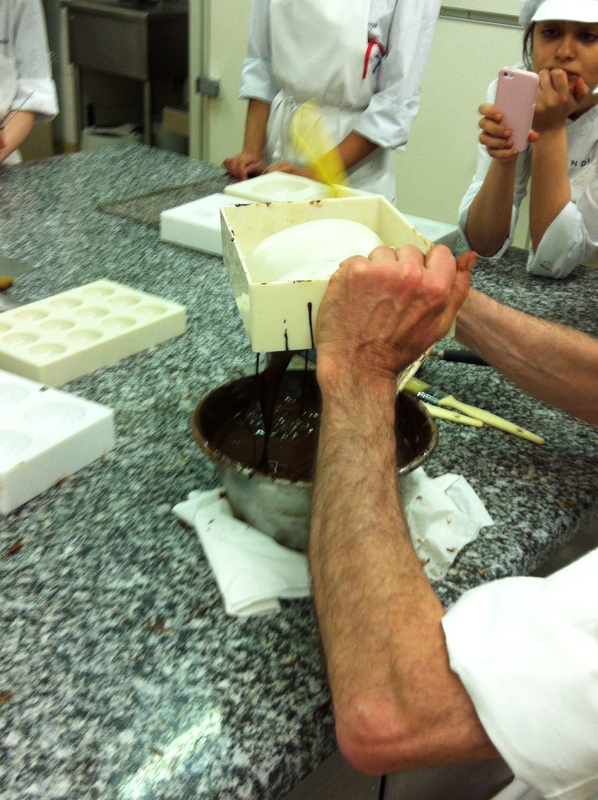 The first lesson begins by learning to temper and cristalise chocolate. 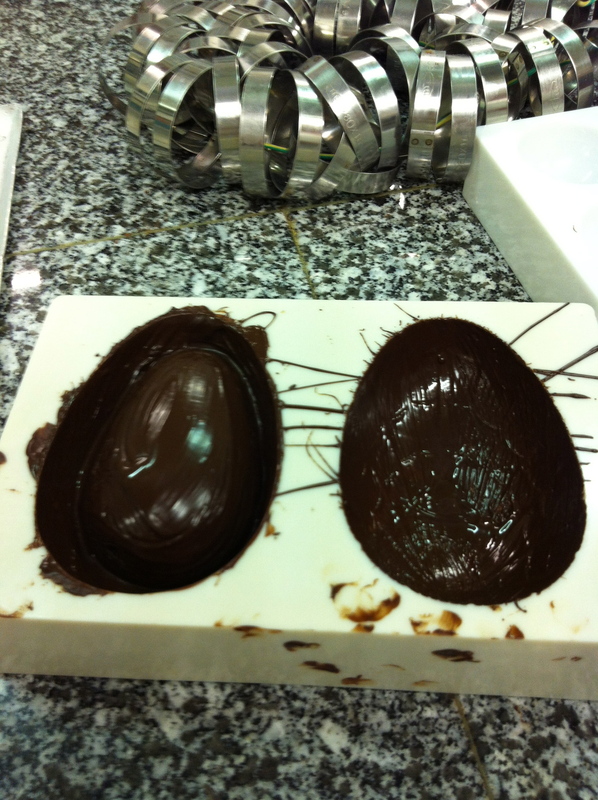 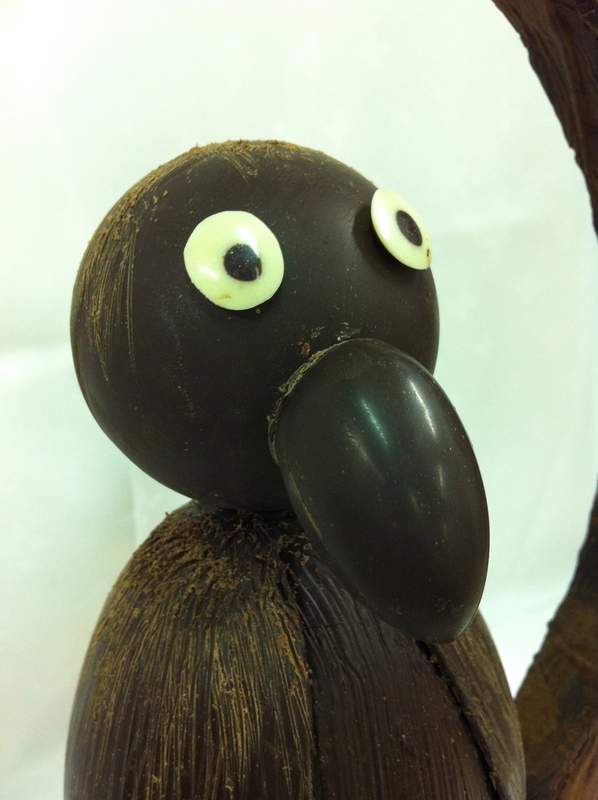 Once the chocolate is tempered we start by creating chocolate eggs by pouring the chocolate into egg moulds. 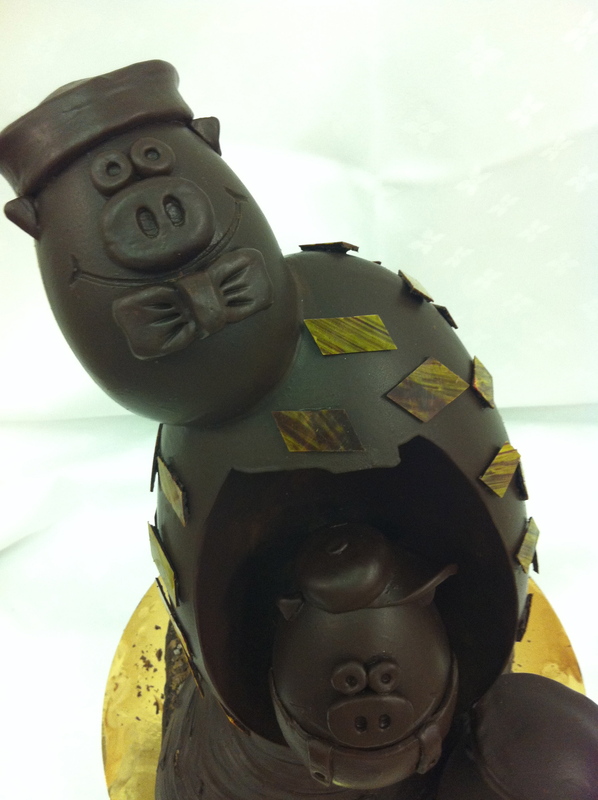 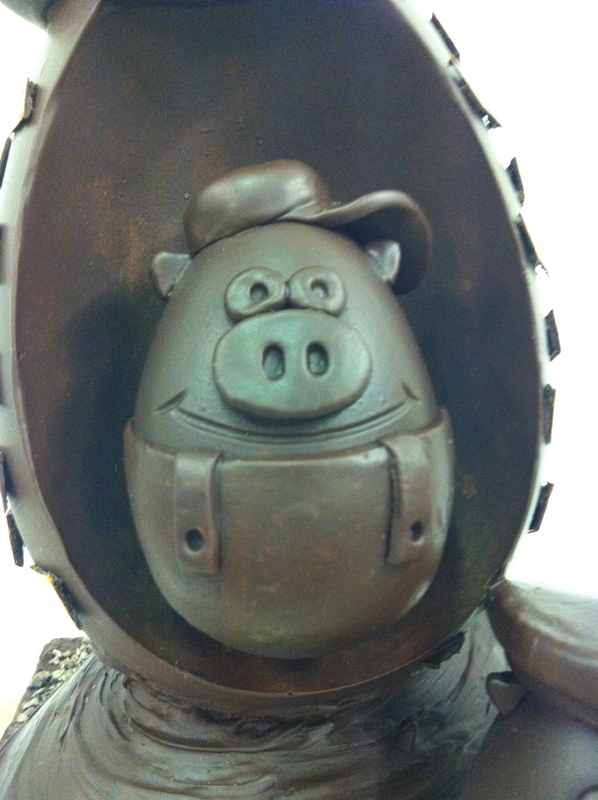 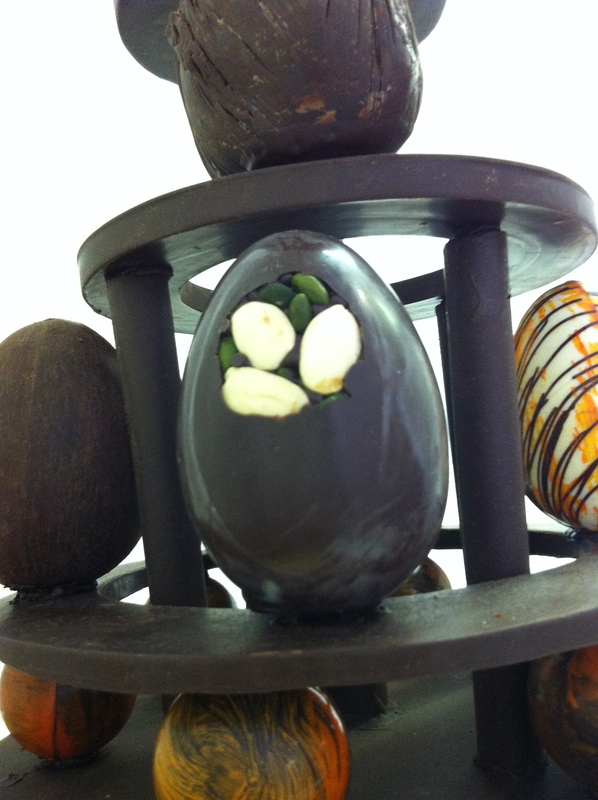 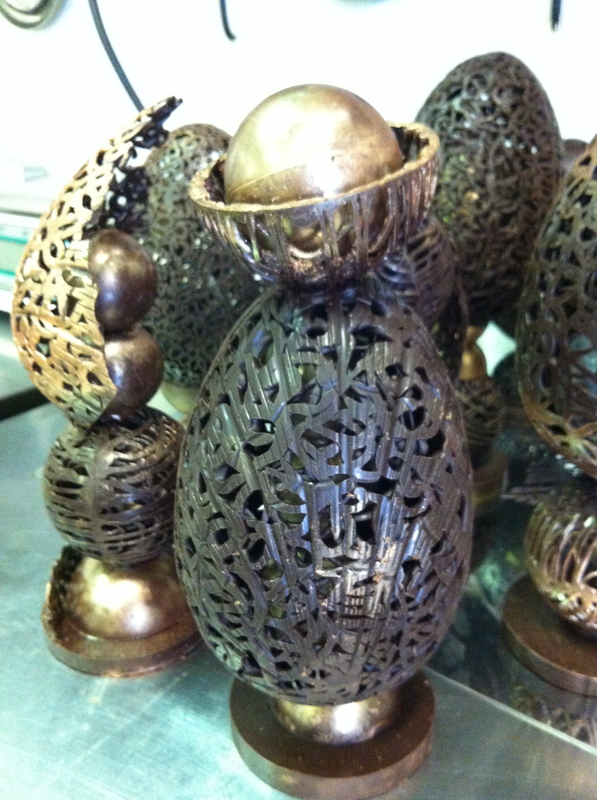 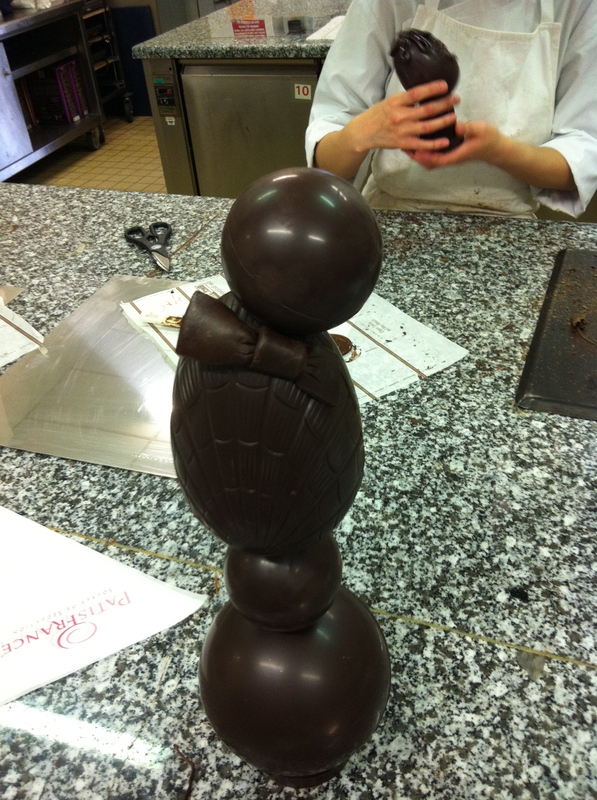 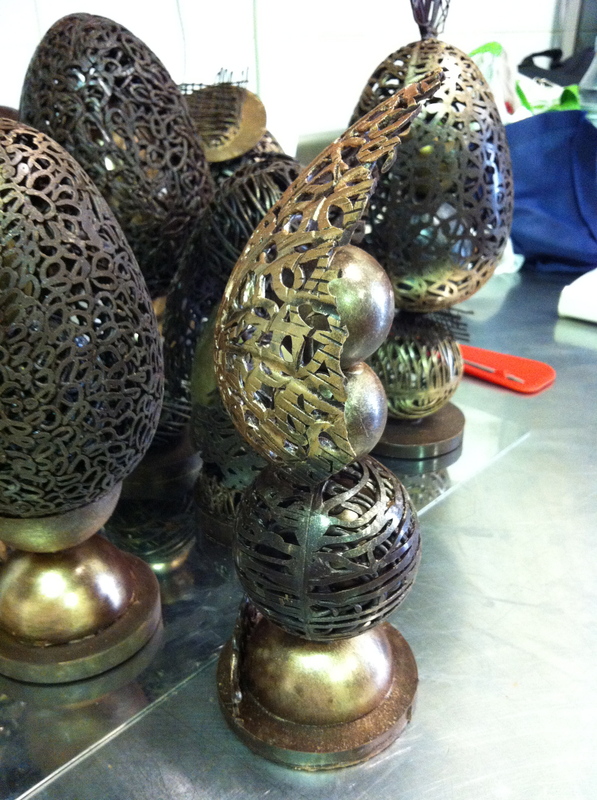 In the second lesson we create decorative chocolate eggs by piping chocolate in spirals into the egg moulds. 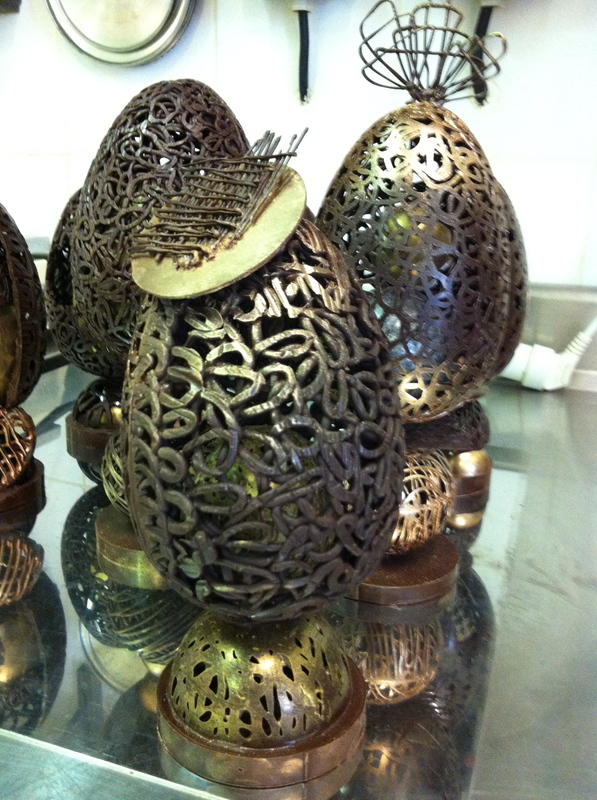 We complete our egg creations by dusting over some colour. 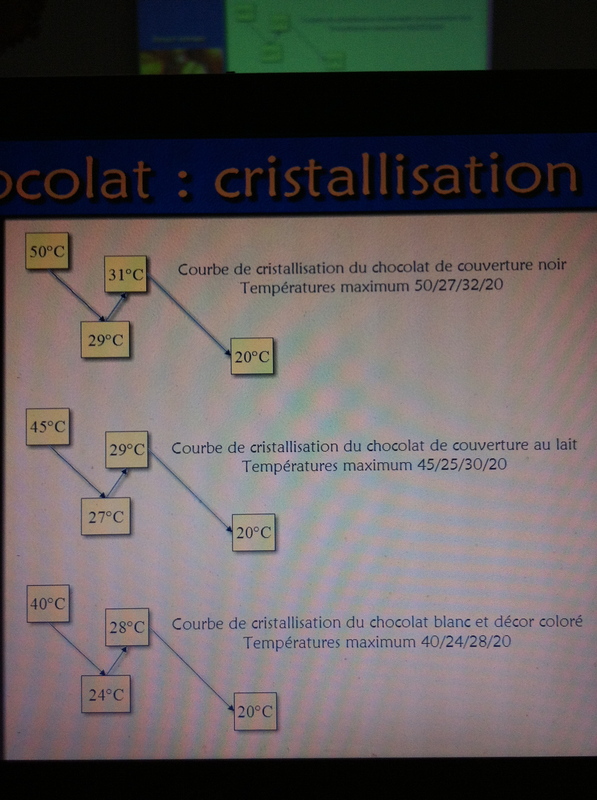 Learning to work with chocoalate and merely understanding its behaviour (whilst working with it) is quite challenging. 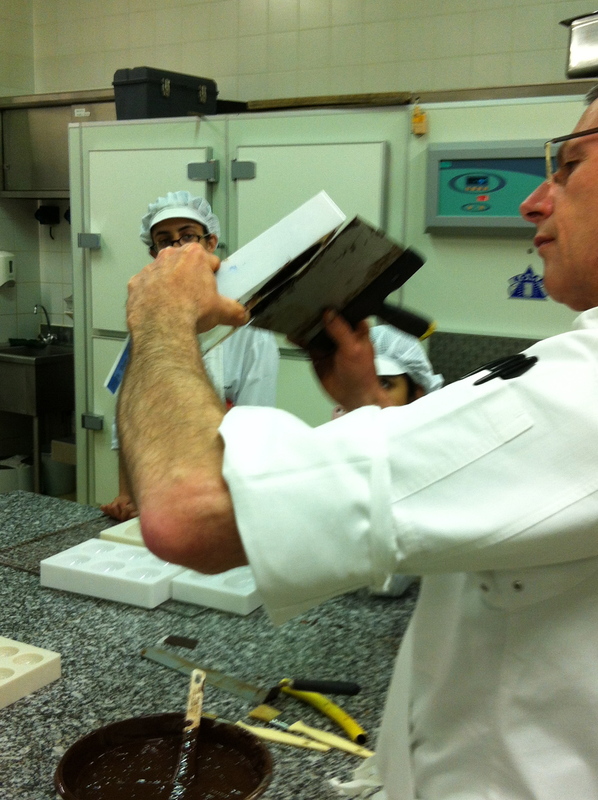 Therefore, it can be frustratiing, tedious and long to work with. 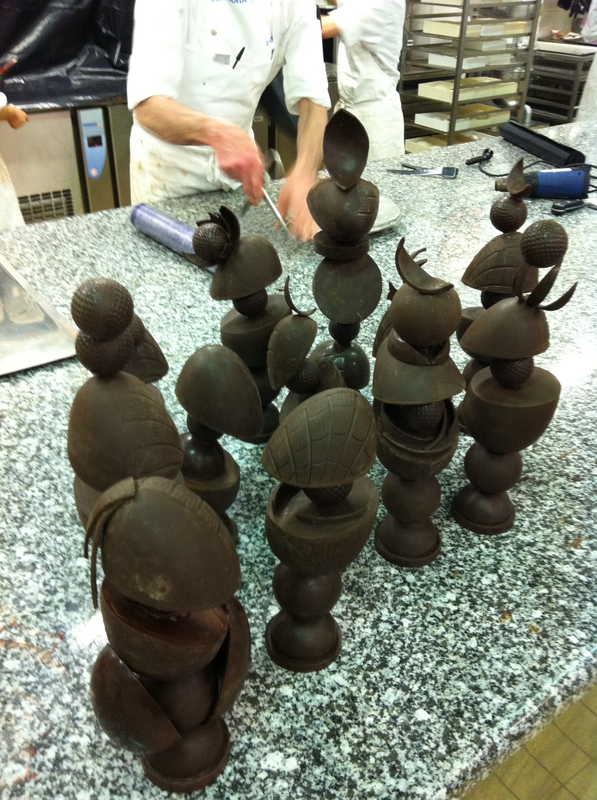 However, once you begin to assemble your moulds to create pieces, such as designer easter eggs, the personality of your work starts to take form and it can be quite amusing and satisfying. 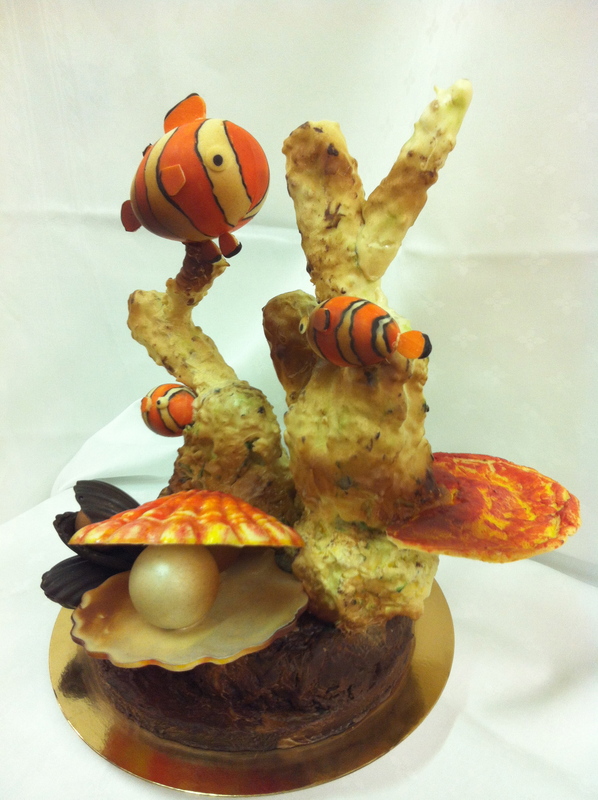 You just have to take a look at the photos below of some of our creations. 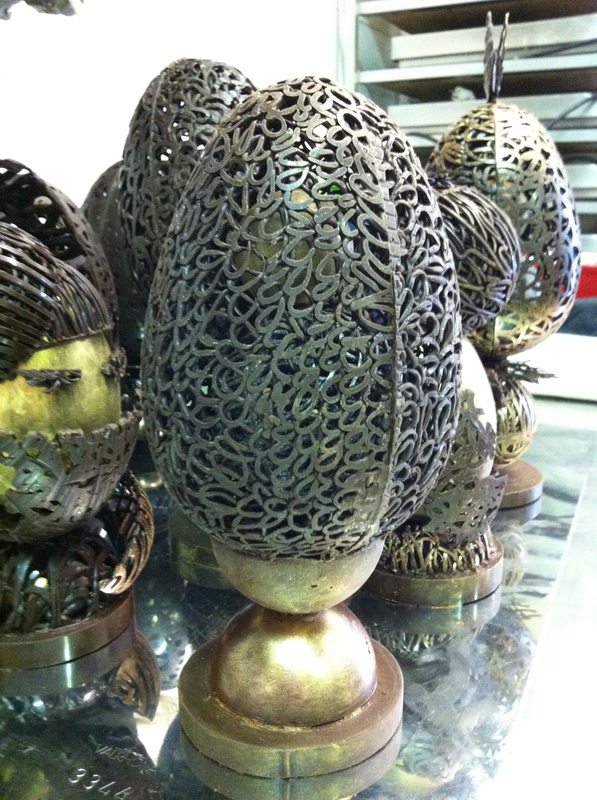 All this work is leading up to work with a final egg project.